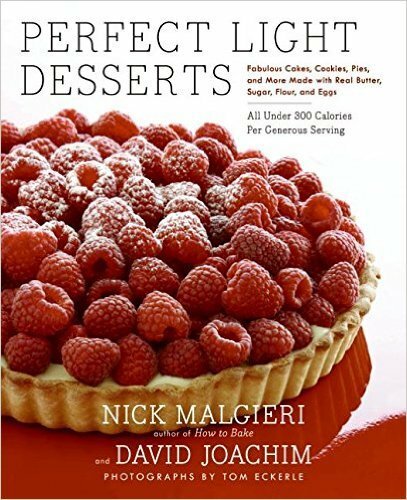 My friend, and master baker Nick Malgieri, just came out with a new book, Perfect Light Desserts: Fabulous Cakes, Cookies, Pies, and More Made with Real Butter, Sugar, Flour, and Eggs, All Under 300 Calories Per Generous Serving. It’s a lovely book of dessert recipes that keeps things on the lighter side. 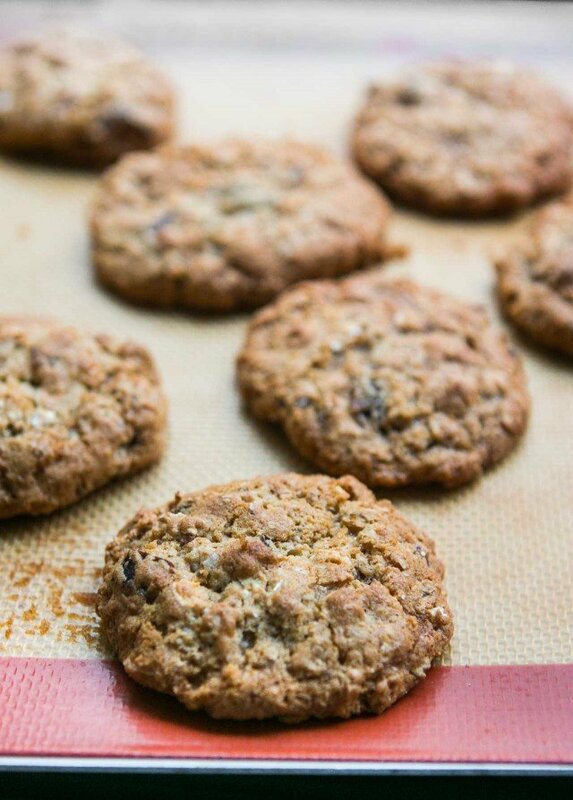 His recipe uses apples in place of the butter found in many traditional oatmeal cookie recipes, which gives them a pleasant chew. 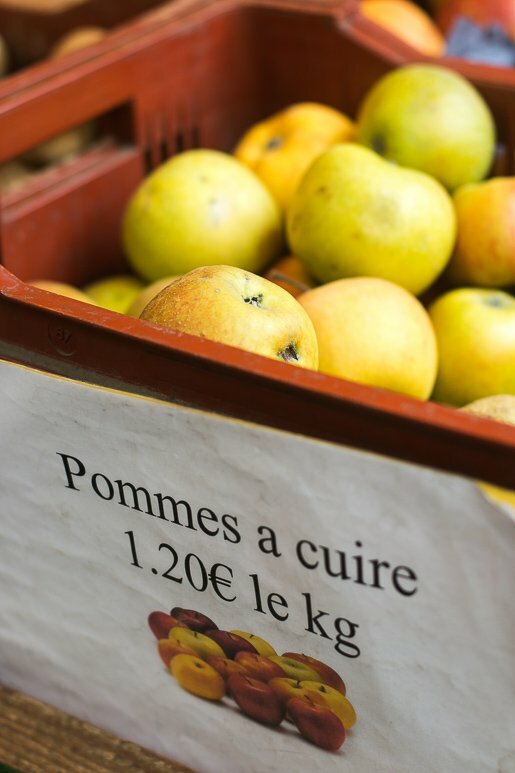 I found some “baking apples” (pommes à cuire) at my market and used them, although you are welcome to use more pristine varieties if you find them. The result were big, delicious cookies with a bit of dried fruit here and there in them. 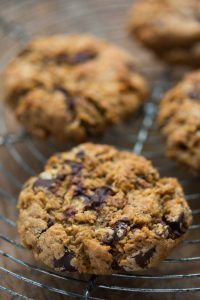 Give them a try if you’re looking for a great, less-buttery, version of oatmeal cookies. Enjoy! Adapted from Perfect Light Desserts by Nick Malgieri and David Joachim (HarperCollins). 1. Preheat the oven to 375ºF and set the rack on the lower and upper thirds of the oven. 2. In a small bowl, whisk together the flour, baking powder, baking soda, and salt. 3. In a large mixing bowl, beat the butter and granulated sugar until smooth. Mix in the brown sugar, then the egg, applesauce, and vanilla. 4. Stir in the dry ingredients, then the oats and raisins. 5. Roll the dough into 1 1/4-inch (4cm) balls and place them 2-inches (7cm) apart on the baking sheets. Use a fork to gently flatten the dough slightly. 6. Bake until the cookies are a gentle brown all across the top, about 12-14 minutes, rotating the baking sheets midway during baking for even heating. Storage: Once cool, store the cookies in an airtight container at room temperature for up to 4 days. I like that this recipe doesn’t call for cinammon, will definitely try this variation. Thanks! Just made some yesterday for a party, call them, “back of the box”, a friends Grandmother used to say back of the box to tell us where to get the recipe after bothering her for what we thought was a top secret family heirloom, Quaker oats box! Yours look more delicious of course! Nice one, David — giving us all the finger through the cookie batter. Of course these look magnificent. You made them! Umami: Cinnamon? Do they have that in France? Jeremy: I love that recipe, but there ain’t no boxes around here. Shauna: I figured someone would ‘point’ that out…and it had to be you! Luisa: Don’t you have a ‘wednesday food section’ recipe for gâteau Opera? TOFU!? Very funny. You inspired me to drag my rear to the store to buy oatmeal. Excellent recipe David! Thank you. Thanks for the recipe. Weird, I’ve been obsessed with oatmeal raisin cookies this past couple of weeks, sampling them from every bakery in town (Portland) in order to arrive at my assessment for “the best”. I’ll keep you posted. I recently made a batch of the orange currant oatmeal cookies from the Tartine Cookbook and was NOT sorry. Extra great with un peu de fleur de sel resting atop each lovely morsel. And, speaking of applesauce substitutions, I replaced half of the butter with applesauce and (extra) pumpkin in the pumpkin tea cake recipe from the same cookbook and received quite pleasant results. I love that you introduced the oatmeal cookies to the French. You should be very proud of yourself. Oh, and I’m adding cinnamon and crystalized ginger! It’s the season…. I have an overwhelming desire to eat the ice cream scoops of cookie dough. Yum. 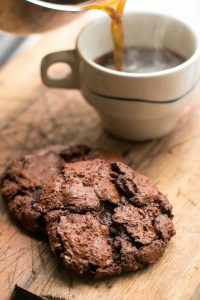 As I was reading, I felt the post was coming to a crescendo with each word I read, as I couldn’t wait to find out if this was a recipe I could actually eat, as I’m really watching my calories, yet on the lookout for delicious snacks (is this possible? ), and these cookies look delicious. The high content of applesauce combined with the low content of butter was perfect, alas, the quantity of sugar was too high for me. Perhaps I’ll be one of those substituters as well, and sub Stevia for sugar, but it will probably make the ratio of dry ingredients to wet go out of whack. Oh well, this recipe has inspired me to experiment to come up with a substituted version of a delicious cookie. Thanks! You live in France, you adore Paris, you have wonderful recipes, but why don’t you take in consideration your “poor” assidous European ( well, Middle eastern in my case) readers who have to run everytime to a certain book to find out what are ounces, spoons, cups etc in gramms. Could you pleeeeeeeeeese have pity on us? 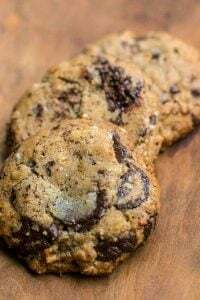 These look yummy, but I have a deep, dark secret: My most terrifying childhood experience was taking a big bite of what I thought was a Chocolate Chip Cookie….and, (are you braced for this) finding a raisin, instead! Now I always put dark chocolate chunks in my outmeal cookies instead of the dried fruit. I’ll let you know…. Gladys: Down with artificial sweeteners! Actually, I’m sure you could cut the sugar down. It would make the cookies a bit less moist (and of course, less sweet.) But they’re pretty ‘flexible’ and I would give it a try. I made these today using cherry-flavored dried cranberries. I wanted dried sour cherries, but wasn’t willing to go all over town looking for them. I also toasted a few pecans and chopped them. They came out great! Even better once I put some vanilla Haagen Dazs between two cookies and made a sandwich! I’m definitely going to buy the book. Thanks David! as a rabid raisin hater, i always sub in dried cranberries. raisins are sneaky and show up unannounced and unwelcome in many bakery items, lurking craftily under muffin tops and cake crusts. long live the craisin! I love your site. The cookies look awesome, I will bake them soon. I have a few apples that need to be made into sauce and I also have a few dried cranberries in my valuable expat stash that I can use. Expat Husband hates it when I weigh down the luggage with dried fruit,pecans and good coffee beans, however, these are hard things to find in China. He doesn’t complain too much though, because, he and our son reap the rewards! I will look for your new book the next time I am in Hong Kong. Actually, stevia isn’t an artificial sweetener, it’s an herb, good thing for people who can’t eat sugar. I’m down with the chemical artificial sweeteners too. 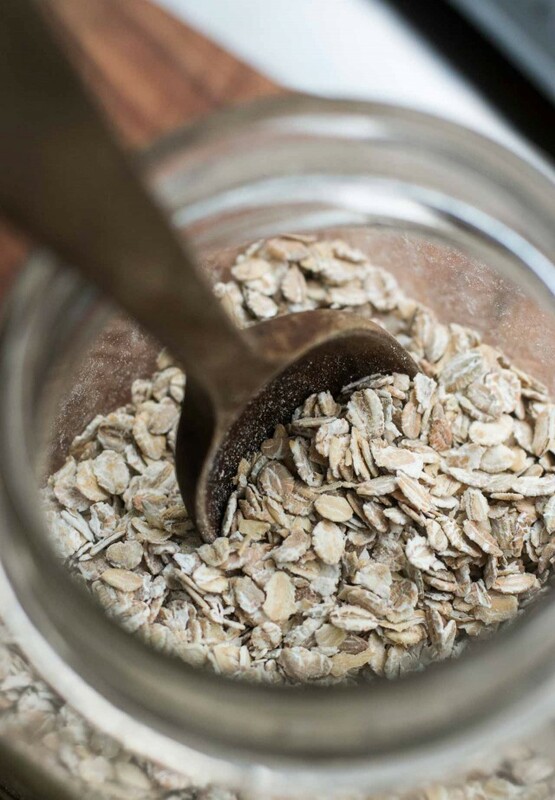 Thanks for the great recipe usually when someone offers me something wih oats in its flapjack all that sugar is no good so its a nice change to have something healthier. I sympathise with Simona on conversions. It seems very strange to us Brits that you measure butter by the tablespoon. I’ve trying to rewrite some of my favourite recipes in the mammoth Cook’s Illustrated that some American friends brought me recently, and some others from Linda Dannenberg’s Boulangerie/Patisserie book and the measurements…sticks, cups, tablespoons or combinations of the three for one ingredient – wouldn’t simple weights in oz or grams be much easier? Hi Catherine (and Simona): I sympathize with your plight, and I had Nick address that in his interview.